Leopard plants are herbaceous perennials with yellow flowers and, in some cases, very large leaves. They belong to the aster family and are native to Eurasia. Leopard plants grow in USDA plant hardiness zones 4 through 8. One of the more popular cultivars of leopard plants is 'Britt-Marie Crawford,' which has large leaves and blooms in mid to late summer. When establishing a plant's taxonomy, botanists use a genus name, a specific epithet, and a cultivar name (as applicable). All of this precision is particularly important in cases where the common name(s) are confusing or not very descriptive. Such is the case with leopard plants. The genus name is Ligularia. 'Britt-Marie Crawford' is a cultivar of Ligularia dentata. 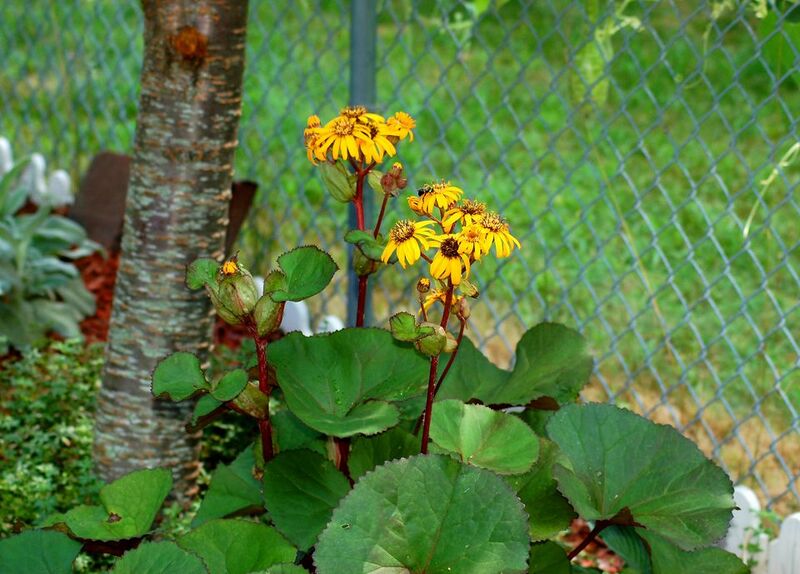 The common name "leopard plant" comes from the spotted leaves found on some plants in this group, but not all types of Ligularia dentata have leaves with spots. Leopard plants are also commonly called "goldenray," "ragwort," and "golden groundsel," but these labels are confusing because they are sometimes used for other, unrelated plants. Ligularia macrophylla: Another leopard plant with large leaves; in fact, the specific epithet for this variety translates literally as "bigleaf"
Britt-Marie Crawford grows to a height of 2 to 3 feet with a spread slightly less than that. These leopard plants produce golden flowers in clusters (technically called corymbs). In cold-winter climates, such as zone 5, the first blooms arrive in early August and provide color for late summer. They are somewhat unusual-looking plants, due to the fact that the flowers emerge from rather curious bracts. Be that as it may, some people grow them primarily as foliage plants. The cordate leaves can become rather large—about 9 inches long by 8 inches wide. More importantly, new leaves emerge in a very dark color of deep purple to black. The tops of the leaves may later turn green while the bottoms retain a hint of the earlier purplish color. This can happen well before blooming time so that the blooming period and peak foliage season do not coincide. Some growers report longer retention of the dark coloration, perhaps due to more sunlight. Leopard plants can be treated as shade perennials. So if you're seeking to expand your perennial choices, you can add them to your list of shade plants. Leopard plants do best in partial to full shade and in organically rich soil that stays moist. They do not do well in full sun and when exposed to strong winds. The more sunlight they receive, the more water they'll need. In terms of soil conditions, working some humus into the soil will help them thrive. They also are good wet-area plants; in fact, many growers state that these shade perennials get pretty thirsty, requiring a somewhat above-average amount of irrigation. Care requirements are minimal. For example, deadheading is unnecessary. To propagate, you can divide these perennials in early spring. The plant texture for Britt-Marie Crawford leopard plants is coarse, so to create contrast in your landscape design, you can juxtapose them to specimens with a fine, airy foliage, such as ferns. Since leopard plants are clump-formers, they can be planted en masse to function as edging plants in shady areas. Meanwhile, their tolerance for (or, in hot climates, their need for) moist soils makes them logical candidates for plantings around water features. And as shade perennials, they are a good choice for woodland gardens. Leopard plants will attract butterflies but are, happily, deer-resistant perennials.